As many of you may already know the long awaited opening of Pottermore had taken place at the beginning of this week no longer having to see the 'Coming soon' plastered on the front of the webpage. I truly am enjoying exploring Pottermore and falling in love again with Harry Potter. Although the story of Harry Potter had come to an end in both book form and the movies within the last five years, Pottermore allows die-hard Harry Potter lovers to explore it all over again. It makes me smile knowing that the story lives on. 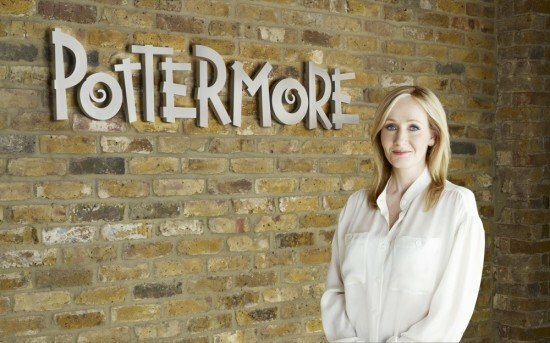 Pottermore also gives users a chance to get insider information from J.K. Rowling about aspects of the book only found on the site. Users also get to go through the chapters with wonderful graphics and animation and relive Harry's journey from the beginning and throughout Hogwarts. You're able to get your very own wand and get sorted into your Hogwarts house by the infamous sorting hat. What I really love about the site is that everything centers on Harry Potter from the chosen usernames to avatars. While exploring you find objects to collect and place in your trunk and hidden clues. I signed up for Pottermore on Monday and have been having a wonderful time dueling other players, getting sorted into my house and learning secrets behind the world of Harry Potter from J.K. Rowling. If anyone would like to add me as a friend on Pottermore my username is PumpkinFeather28948. Can't wait to hang out and have with all of you in the virtual magical world of Harry Potter. Prior to getting your wand and being sorted into your house you're asked several questions that you must answer truthfully from personality questions to odd questions and physical attribute questions like about your height or eye color. Once placed in your house you earn points for your given house just like in Harry Potter...my house is losing undeniably and the last time I checked I believe RavenClaw was in the lead. When it came to my wand I answered a few questions and the result was "Alder with Unicorn Core, Ten and Three Quarter Inches, Surprisingly Swishy" Soon after I arrived at Hogwarts I had the sorting hat placed on my head and was given yet another set of questions to determine which house was for me. I was sorted into HufflePuff! I really didn't expect to be sent there but according to the Prefect of HufflePuff, who's name I already have forgotten (whoopsie) we're known for our honesty, modesty in terms of not boasting about how truly brilliant we actually are ;) and just pure awesomeness. Cedric Diggory was a HufflePuff so I guess it isn't all that bad ;). Our mascot is a badger...I'm still not sure how I feel about that but I'll let you know when I find out.